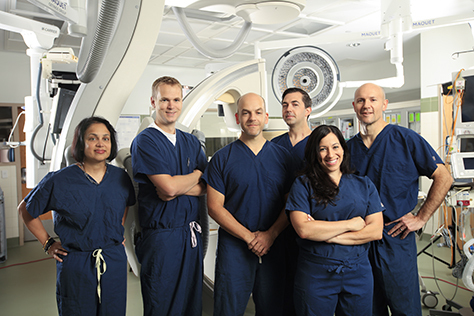 Every day, cardiologists, cardiac surgeons, vascular surgeons, and cardiovascular nurses come together at UR Medicine to bring patients the most comprehensive, technologically advanced care available in the Rochester region. They’re deeply experienced in their respective specialties. They participate in groundbreaking research into new treatments. And, most of all, they bring a personal touch and collaborative spirit to every case. Our cardiologists have expertise in every type of cardiovascular disease, from heart failure to hypertension and heart rhythm disorders. They collaborate in multidisciplinary teams to deliver everything you need for better heart and vascular health. Our internationally recognized, board certified cardiac surgeons deliver the most comprehensive care to patients of all ages. They’re responsible for all pediatric cardiac surgery cases from Utica to Buffalo. Plus, they serve within the region’s only tertiary care center for patients who have end-stage heart failure, complex aortic disease, or who require high-risk cardiac procedures. Our vascular surgeons treat a full range of disorders related to arteries and veins, and are committed to providing you with individualized, compassionate care in state-of-the-art treatment facilities. Our pediatric cardiologists provide a broad spectrum of cardiac services for infants, children, adolescents, and adults who have congenital and acquired cardiac problems, including long-term care and preventative cardiology services. Rebecca L. Schallek, M.D., Ph.D.
Kathleen G. Raman, M.D., M.P.H.